First off, I want to say I am sorry for the article you are about to read. I hope I don’t offend any of you. I feel the need to share this topic, and I hope some of you will benefit from it. If this isn’t something you were expecting to read or are not interested, again I am sorry in advance. 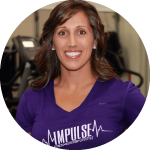 Being in the service industry as a trainer at Impulse I come into contact with lots of different people. Our clients range from stay at home moms to CEOs or business men and women to kindergarten teachers all the way up to high school teachers. Either way, each person who walks through our doors is different and has different experiences day to day. Some come in ready to work, some are stressed and need a release, some walk in feeling defeated from an emotionally and physically taxing day. So us trainers experience a lot of unique moods. Some being easy to work with, and others being difficult. I’ve noticed that, because of my role and wanting to be sure that I provide the best experience each time I interact with my clients, I tend to apologize a lot. Often times, I don’t even know what I am saying sorry for. After trying to become more aware and implementing a different response, I began to see things change in how others responded to me. “I’m sorry” is a phrase most of us are familiar with, and some may even incorporate it in our daily vocabulary quite a bit. This simple phrase can carry numerous heart felt meanings and compassion towards someone who may be grieving or struggling. “I’m sorry” can express a great deal of genuine remorse for a wrong doing and to own up to a mistake that’s been made. However, this little phrase can also place a big burden on some when used in another context such as our day to day communication. The use of “I’m sorry” in its simpler form, tends to cause the phrase to lose its value or meaning. It becomes over used and instead of demonstrating a high level of compassion and care for others, it begins to take on a sense of negativity by the user. This can occur when the phrase “I’m sorry” is being inserted by the user after an action of theirs. Using “I’m sorry” in this context is stating that they are in the wrong or that they feel less of themselves and need to apologize. The negative portrayal of their self to the recipient will now be a reflection of what is an acceptable view of the user. The recipient automatically has a negative feeling attached to whatever the situation may be or to the user just because the user stated that the action was wrong. Or the user has just positioned themselves lower or lacking in confidence, creating doubt in their abilities. One way to avoid this negative reaction would be to switch the phrase “I’m sorry” to “thank you”. I’m sorry for being late. — Thank you for waiting for me. I’m sorry I’m in such a horrible mood today. — Thank you for being here for me, you’ve really helped make my day better. Sorry to interrupt but, — Thank you for taking the time to work with/help me. I’m sorry I can’t come. — Thank you for the invite. I’m sorry I’m not very good at this. — Thank you for allowing me the opportunity to get the hang of this. I’m sorry this is so confusing or difficult to understand. — Thank you for being patient as I try to explain this properly. The point of rearranging some of our vocabulary is not only to increase our own value in our self and to remove negativity in our own life, but in others as well. Negativity spreads quickly, like a virus, but so can appreciation, gratitude and joy! Being intentional with the use of “thank you” or any other phrase that promotes positive feelings can spread through you and to others. This can increase the chance of a better outlook on your day to day experiences as well as enhance your relationships with others. But making these small changes doesn’t mean the phrase “I’m sorry” is erased from your vocabulary. There are certain times when it is necessary to say you are sorry for an action in order to not be rude. Just become more aware of the apology and whether it is out of habit or out of necessity. We don’t want to “cry wolf” and then find our sincere apologies are not received as authentic. I’m sorry if this took too long to read; just kidding! Thank you for your time!